Yesterday, thinktank Reform had another go at rallying support for a serious package of fiscal salvation. Pointing out that current plans leave our overall indebtedness (debt-to-GDP ratio) rising for years - maybe decades - to come, they call for a bigger retrenchment than any of our main political parties are currently contemplating. By 2013-14 they say we should have reduced annual borrowing from 12% of GDP to 4.5%, and that the vast bulk of the action should comprise spending cuts rather than tax rises. Clearly, the Reform programme requires much bigger public spending cuts than any of the main political parties will yet admit to - £85.7bn vs Labour's planned £57.8bn - but it sounds much closer to what we need. As we all know, the only thing that will rescue us in the long-term is growth, and tax rises risk killing growth stone dead. 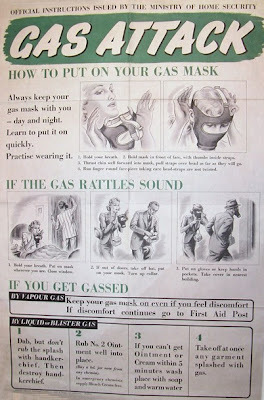 Ah, but remember the gasmasks in World War 2. At the War's onset everyone had been issued with one and told to carry it at all times. And initially they did. But as the months of Phoney War dragged by with no gas attacks, most people stopped. They reckoned it had all been a gigantic false alarm. That's so much like where we are now. On one level, everyone knows we have a problem with government borrowing, but the consequences have not yet become apparent. Gilt yields remain well-behaved, the tax rises haven't yet kicked in, and life goes on. Where's the courageous politician who's going to speak truth unto the people? And frankly, where's the politico who's even going to grip the problem post the election? Even if there's a majority government after the election, is it really going to announce spending cuts of £87.5bn? Is it really going to brave headlines about its attacks on teachers and nurses and old people and babies and fluffy little lambs? Or is it going to fall back on that good old British standby - muddling through? Yes, we stand for fiscal discipline and tough decisions, but no, of course we won't attack fluffy lambs... we'll leave that to someone further down the chain of command. How much better it would be if the politicos had the courage to make the real decisions on priorities right there, where the buck ought to stop - with them. The politicos fail to take decisive action to correct the budget deficit; the market vigilantes attack; sterling collapses and gilt yields soar; the politicos are finally forced into action, but without the breathing space for proper planning; their emergency measures involve big tax rises and big spending cuts; the cuts are across the board, lacking detail on what specific services should go; far down the chain of command, right out at the sharp end, public infrastructure decays, class sizes increase, hospital waiting lists lengthen, and soldiers die. We really do not want to go back there - especially since today's fiscal black hole is more than twice as big as the one we had then.